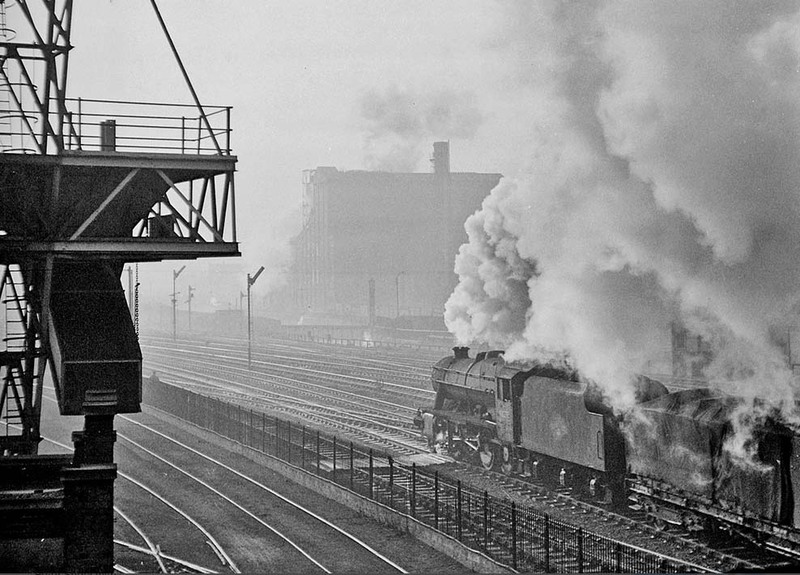 Ex-LMS 2-8-0 8F No 48273 is working hard as it passes through Saltley on a cold 7th December 1962. Built as LMS No 8273 by the North British Locomotive Company in June 1942 as part of the order placed by the Railway Executive Committee (REC) on behalf of the War Department¹, No 48273 was to remain in service until August 1965 when it was withdrawn from 9E Trafford Park shed to be scrapped. ¹ On the outbreak of the Second World War, Stanier's 8F design was chosen to become the country's standard freight design, reprising the role the GCR Class 8K had in the First World War. The War Department had two hundred and eight locomotives built by both Beyer Peacock and North British Locomotive Company and requisitioned a further fifty-one from the LMS. The production of Stanier's 8F locomotives for the War Department continued until 1943, when the cheaper WD Riddles 'Austerity' 2-8-0 was introduced, a design developed to be cheaper and use less scarce resources and labour. The Stanier 8F locomotive continued to be built by the LMS for its own use but with the REC's 8F locomotives becoming available after the war no more were built after 1946.